This is the body of an animal bred to give a large pelt with an enhanced area of useful fur whilst at the same time providing a top class meat rabbit. Take a William pear sliced in half and place the cut surface downwards, view it from the sides and the top and you have the traditional guide to the mandolin shape. The musical instrument of course will show the same form in its sound box, but William pears are a bit easier to get hold of nowadays. The ideal adult Beveren has a long and gradually widening rib cage; the spine sweeps smoothly upwards, reaching its highest point just in front of the top of the haunches, and then descends more rapidly in a curve over the haunches to the tail. The highest point of the spinal profile will be 2 to 2.5 inches (5 to 6.3 cm.) above the top of the haunches. The haunches will be strong, well padded with flesh and held close against the body. The highest point of the mandolin profile will be between 2 and 2.5 times the height at the shoulders. When viewed from above, the Beveren’s shape will again echo the mandolin. From the relatively slender shoulders, the body sweeps out and curves around the haunches. At this point the Beveren is about twice the width found across its shoulders. This graceful curve of the body line from shoulders to tail can be destroyed if the ribs widen too quickly. With ‘flared ribs’, the body will be lumpy in the centre and the beauty of the shape ruined. Flared ribs are most obvious when the hand is passed along the back and are detectable from about 10 weeks of age. Watch out for them. Whilst the Beveren must be muscular and strongly built, over-emphasis on strong front legs can increase the development of the shoulders to a point where the mandolin shape is endangered; a New Zealand type of front will turn the Beveren into a dumpy block. Whilst putting strength into the Beveren bone, breeders must remember that the front of the body needs to be strong, yet slender enough to give the correct starting point for the mandolin form. A lack of straightness in feet, most marked in the forelegs, is prevalent when the bone is too fine. Youngsters with this fault should not be kept. Even so, no rabbit front leg is perfectly straight. There is a slight, but quite natural, outward turn to it. Only the obviously rickety ones should be culled. A broad forehead is required. Adult does should measure about 2.3 inches (5.8 cm.) between the eyes, extending to at least 2.5 inches (6.3 cm.) in mature bucks. The face descends gradually to a broad muzzle: any tendency to an angular type of face is to be discouraged. This sort of sharp-featured muzzle has a mean and most un-Beveren look about it; such specimens can be described as ‘chisel faced.’ The profile of the correct head is distinctly Roman featured, the face being rather down-curved. The average ear length is 5 to 5.5 inches (12.7 to 14 cm. ), which is very close to European standards. Ears shorter than this would look wrong on the Beveren head. As the ears are strong and rather heavy, excessive ear length can lead to bad carriage. 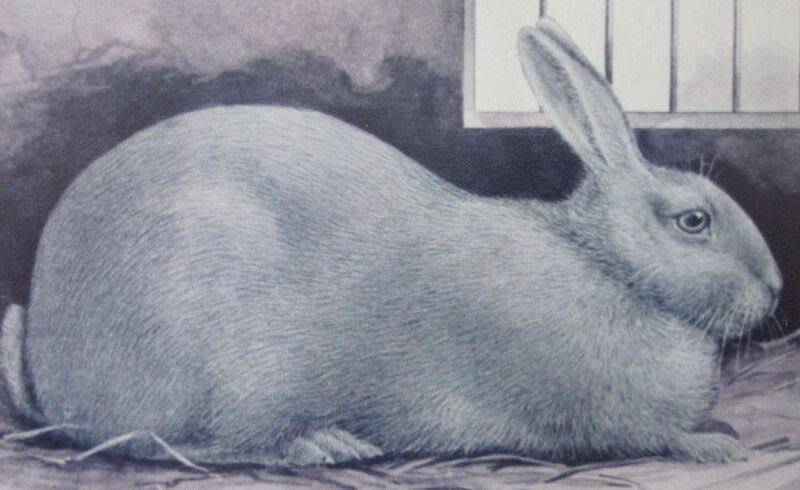 The ears are liberally covered in fur and naturally open in the form of an elongated spoon, but not as wide-open as those of the Flemish Giant. They are rounded at the tips and held above or behind the head in a ‘V’ form. Any tendency to droop forwards across the eyes is a weakness to be selected against. Defective ear carriage is demonstrated in the heat of the Summer Shows, when the ears of many, otherwise good rabbits, tend to flop downwards. This problem, in youngsters of around 12 weeks, should be treated with patience; a further fortnight’s maturity often leads to recovery. The White’s eye is a striking shade of bright blue; those of the other colours match the body. The hazel eyes of the Brown glow ruby in the half-light, and those of the Black, which are normally dark brown and black, give off a rare and startling fire in some dim lights. I kept Blacks for five years before I noticed this and was astonished. A few Beverens carry a prominent eye membrane, which is most noticeable when the rabbit is nervous. In the worst cases, this ‘haw’ will cover almost 40 per cent of the eye. The oddity is variously known as ‘haw eye’ or ‘cod’s eye’ and, though not mentioned in the standard, it is unsightly. It is interesting to note that early British breeders regarded the ‘haw eye’ as a sign of a genuine imported Beveren. This was a normal feature of the first imported stock; hence, it was a valued proof of pure Beveren descent at a time when fraudulent Beverens were on the market. Within a very few years, however, leading Beveren importers were urging that the ‘haw eye’ should be bred out because it was so unsightly. It still appears in some strains but vanishes following an outcross to a clean-eyed Beveren, showing that it is probably due to a recessive gene. An adult should be at least 8 lbs. (3.6 kg.). The most vigorous youngsters will have achieved this by the time they reach five months and will spend their last three weeks in the ‘under-five months’ classes at risk of being disqualified as over-developed. In Britain, there is no maximum weight for an adult. A good stud buck will be at least 9, and preferably 9.5 lbs. (4 or 4.3kg.). Does are normally in excess of 10 lbs. (4.5kg.) when fully mature. Very great size tends to damage Beveren type and this will set limits on the heavyweights. Occasionally though, a 14 lbs. Beveren will appear with the strength of frame to carry all this weight and not slump beneath it. When these rare specimens are seen, they present a magnificent sight. Remember that the Beveren does not gain extra points for size; however, in Britain, a judge will often favour the larger of two otherwise equal exhibits. The British form of the breed has been encouraged to be as large as possible, whilst European standards set an upper limit. Bringing the hand through the coat from rump to neck, no feeling of coarseness should be detected. There should be a resistance to the hand due only to the coat’s fullness and density, yet it will give a sensation of exquisite softness, almost as though it had been slightly lubricated. If the fur is too soft, the coat will not have enough ‘body’ to give the correct resistance. The coat should return gently but firmly almost to its original position, but not in a ‘fly back’ or rapidly returning manner. The best coats, when in their prime, seem unmarked, and not to have been touched, within a few seconds of this handling. Beveren coats of top quality appear, at first glance, to have no guard hairs; in fact they are rich in these supporting hairs. This is why a true Beveren coat has such life and movement. The guard hairs tend to be of the same length as the main coat and do not project much above the pelt surface. If the guard hairs are longer, standing proud of the coat, they spoil the clean looking surface that Beveren fur should possess and might give a sensation of coarseness. Strongly developed guard hairs may also result in the coat remaining open after the hand has been passed through. The term ‘lustrous’ describes the shining appearance of a good quality coat. It is bright and sparkling and should never appear dull or lifeless. This definition applies equally to all the colours, each of which should display a gleaming gloss. The Beveren coat, in its prime, has a character of its own. It behaves in a manner that is subtly different from that of other fur breeds that, nonetheless, have a similar coat description. These differences are difficult to describe – they are best observed in mixed classes on the show bench when the best of each colour is present. This is possibly the most neglected part of the standard, yet it was written specifically to preserve the Beveren coat character. A coat of maximum density, of 1.25 inches (3.2 cm.) length, without a spiky array of projecting guard hairs, and full of life and movement, is the ideal. Coats of more than 1.5 inches are quite beautiful but they are for other breeds, and do not demonstrate the coat of the perfect Beveren. However, breeders and judges alike are sometimes mesmerised by a long coat’s richness and flow, and are inclined to praise it, whereas a Beveren coat should not be so long and flowing. Beverens are sometimes marked down for being ‘short coated’, when in fact they fit nicely into the standard, whilst their long-coated kindred move up the table. Here, the judge is at fault, not the stock. Judges rarely measure coat length with a calibrated ruler. They rely on the thickness of their fingers as a guide to the one-inch minimum, but appear to have no ‘rule of thumb’ method of gauging the one-and-a-half-inch maximum. The hair should be straight. A crimped or crinkly effect on the hair shaft is an indication of ‘woolliness’; this is seen most readily around the haunches, above the tail and in the groins. In its severe state, when such a coat is handled, it will lie in every direction in a tangled manner. This is ‘decided woolliness’ and is a disqualification, in fact, the only disqualification that the current standard contains. The defect is inherited and due to the ‘woolly,’ and perhaps the ‘waved,’ recessive gene. From: ‘The Beveren Rabbit’: Breeding, Showing, History, and Genetics by Harry Nicholson. 2nd edition from Amazon.co.uk. The 1st edition can be obtained from the Beveren Club at a much reduced price.